Reduce. Reuse. Recycle. We all know recycling is important. Maybe we try, or maybe recycling is just a passive thought. When a term loses its flavor, but the meaning is still indispensable, where do we turn? Leave it to the fashion industry — the forerunners of invention– to reiterate the importance of recycling. Iris van Herpen, a fashion designer who creates couture 3D printed clothes, verifies that recycling is no longer a chore, but an art form. Even luxury brands are embracing up cycling. In an interview with Sass Brown, author of ReFashioned: Cutting-Edge Clothing from Upcycled Materials, Brown said, “Livia Firth already challenged a number of luxury brands- including Armani and Valentino- to fashion red carpet gowns from recycled fibers for red carpet season.” Though not all of us are designers with the latest technology at our fingertips, the thought is not so far off. Examining some of the proffered concepts from PSFK’s innovation contest – the Electrolux fabric pen, Zero Waste concept, PETE printer— recycling could be as trendy in fashion as Givenchy’s F/W 2015 line. Not that a cotton knit with an unintended hole may be too shabby, but why should landfill be the next viable option? The Fabric Pen by Electrolux scans the type of material your clothing is made of, and matches its color and texture. An identical patch (that’d be removable, washable, and disposable for re-dos) would then attach to loose fibers and solidify after oxidization. A set back with recycled clothing is the lack of trendiness and hipness that the fashion world feeds off of. Instead of taking your old clothes to the thrift store only to buy new ones, what if you could simply use those clothes as a raw material to print new ones? The Zero Waste concept would allow a user to fill a device with old garments, scan your body measurements, and select a style and color of garment on a touch screen catalogue. A 3D printer would then print the garment as a ready-to-wear item. While this still does not solve the issue with all those plastic bottles, fear not, because the concept of PETE merges plastic bottles to create new garments. A consumer would choose the style, color, and construction, while a machine predicts the amount of PET bottles needed for the fabrication. A machine would then convert the bottles into polyester that would be made into the desired garment. Mass marketers have taken to the idea that recycling is the only way to continue to produce goods and meet consumer standards. According to Brown, “The larger the company, the more waste they are producing, therefore the greater potential for upcycling on a large scale.” Consumers are smart and corporations are transparent with media exposure. 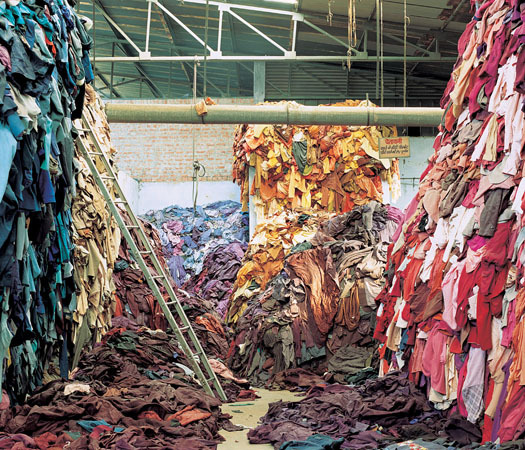 Take H&M, who delved in to the intimate issue of textile usage and disposal associated with mass production. While they discovered that a reduction in CO2 could reduce waste, the ultimate reduction derives from collaborating with other corporations in manufacturing, who all agree on a common cause. To do their part, H&M accepted donations of second hand clothing from consumers and offered a discount on new products. They then handed the second hand clothes to the SOEX Group, a German company committed to sustainable development in clothes for recycling and reprocessing. Whether a mass corporation like H&M or a private boutique designer fight for the recycling enterprise, the prominent point is simple. Recycling is important. It may be a trendy hashtag on Twitter, but the fact is that this earth is all we have. A little effort to push for a more earth-friendly manufacturing process may just be worth the outcome. As technology advances, chic-recycling may just be the next big fashion statement. DAVID GUETTA GETS A NEW SOUND WITH "DANGEROUS" + NEW ALBUM "LISTEN"